We are committed to ensuring your Flywheel implementation is a success. Our Process Mapping Service ensures that we get the right automation in place to get you a win right away. A process map is a planning and management tool that visually describes the flow of work. 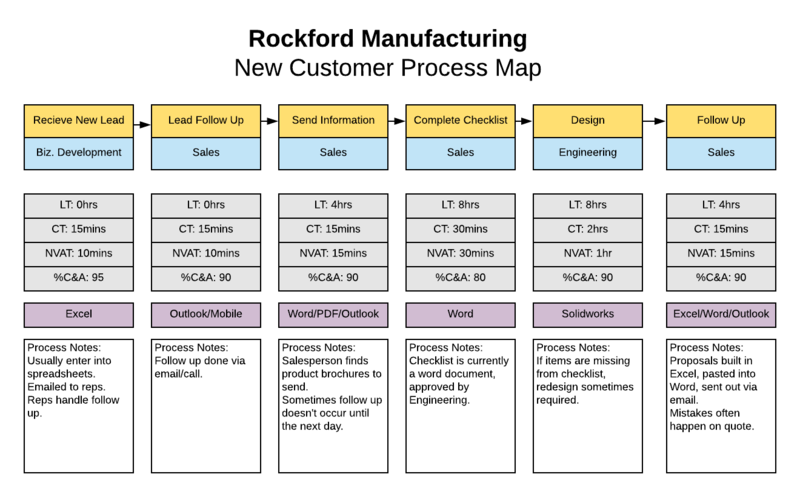 Our goal is to use process maps to identify/eliminate waste in your process and streamline it wherever possible. Done right, this exercise can eliminate significant amounts of waste in your organization. Lead Time (LT) – How much time is needed before the process can begin. Cycle Time (CT) – Amount of effort for someone to complete the task. NVAT (Non-Value Added Time) – Wasted time in data entry/re-entry or finding information. % Complete & Accurate (%C&A) – Percentage of the time the process completes successfully. Our goal is to map each step in your marketing/sales process to identify opportunities for automation and improving effectiveness. On average, we can improve sales processes by 10-15%. Recommendations of processes we propose automating/streamlining. Contact Flywheel today to schedule your Process Mapping session! We generally complete process maps in 2-3 days of work – preferrably onsite if possible (travel expenses apply). Book your process map deep dive now!